The Office of the Webb County Public Defender was created in Webb County in 1988 to ensure legal representation to indigent defendants charged with adult misdemeanor and felony crimes. In accordance with the Fair Defense Act as required by Senate Bill 7, its is our duty to provide zealous representation to all clients appointed to our Office. 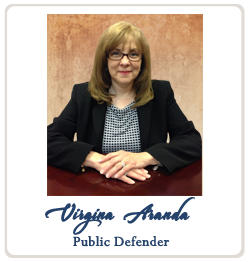 Since its inception, the Office of the Webb County Public Defender has represented thousand of clients. The Office is comprised of fifteen attorneys, seven secretaries, two investigators, an executive administrative assistant, and a receptionist. The Public Defender's Office is responsible for representing adult defendants in both the district and county court-at-law. They deal with more than 125 felony and misdemeanor cases each month. In upholding the right of their clients, the attorneys work closely with both the District Attorney's Office and law enforcement agencies. The office of the Webb County Public Defender is located on the first floor of the Administrative Building in Suite 102. Office hours are Monday through Friday from 8:00 a.m. - 5:00 p.m. The office is closed during the 12:00-1:00 p.m. lunch hour.